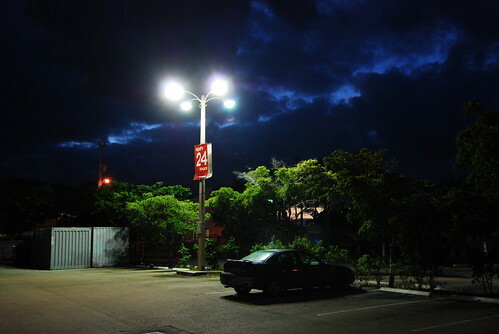 Miami at night, a new photoset. The downtown shots are hand-held, the South Beach shots are mostly . . . well, that’s right, I was the guy schleping around the beach with a tripod at 5 in the morning this weekend . . .
No obligatory Ocean Drive shots? Sacrilege!! Figured I’d save those to do during the week when it’s less teeming with people. Or to put it another way, I was doing these first few to work out the technique. I’ll do Washington/Collins/Ocean when I know what I’m doing. The night shots are super. I’ve been giving my photo students a night shot assignment over the past few years but, most haven’t done a good job. They seem to think they can’t take a picture if they’re not taking pics of lights. So, after finally realizing how to address that issue, this semester’s photos were awesome. Very nice. I like the blue/green pics best.